Mike Schmitz takes a look at the strengths and weaknesses of Thomas Robinson, with the help of Kansas game-film and head coach Bill Self. As we anticipated in the preseason, Kansas's Thomas Robinson seemed primed for a breakout junior campaign in 2011-2012. After a productive sophomore season playing limited minutes, as well as some impressive summer showings, NBA scouts were anxious to see how Robinson handled a larger role this season following the departures of the Morris Twins, who played the majority of the minutes at the big positions for the Jayhawks last year. Through the regular season, Robinson has exceeded all expectations, making a seamless transition from bench player as sophomore to one of the most dominant players in all of college basketball as a junior. He's led Kansas to a surprising top five national ranking, while establishing himself as one of the frontrunners for National Player of the Year honors, along with Kentucky's Anthony Davis. Much of the intrigue with Robinson prior to this season revolved around his outstanding physical tools for an NBA power forward prospect. Listed at 6-10 this season (he measured the same in shoes at the LeBron James Skills Academy over the summer) with a 7-1 wingspan, broad shoulders, and a chiseled frame, Robinson also possesses excellent quickness and explosiveness for a player his size, which he further enhances by playing with tremendous energy. These traits are on full display when watching Robinson on the glass, as once again as a junior he was second amongst all players in our database in rebounds per-40 minutes. His size and strength enable him to get good position inside, and his length, athleticism, and energy allow him to go get rebounds out of his area. This is an area where he can make an impact immediately at the NBA level, giving him a skill to hang his hat on while he continues to polish some of the other facets of his game. While Robinson's ability to affect a game with his energy and rebounding likely won't be in question by NBA scouts, his upside as an NBA player will likely depend on how he improves his skill level on the offensive end. What he's shown this season, though, as the leading scorer and focal point for one of the nation's top teams, is certainly encouraging. He's done much of his damage on the block, as about a third of his possessions come on post-ups. Bill Self's Kansas teams make it a priority to get the ball into the paint, and Robinson does a great job of establishing position and making himself an easy target to receive entry passes from his teammates. Once he catches the ball in the post, he isn't the most fluid player, but he has shown improved footwork and a developing skill set as a junior. He's able to shoot jump hooks over either shoulder, face up and shoot a jumper, or make a power move to the rim. He goes up strong and aggressively with the ability to finish above the rim or draw fouls, but has also displayed a soft touch finishing with either hand. Robinson has also shown flashes of being able to catch the ball facing up and isolate his man at the elbow or in the mid-range area. He's a very good ball-handler for a player his size and he's able to utilize his quickness advantage on most opposing big man and get to the basket on straight line drives. He also does an excellent job using spin moves to change directions and get to the rim. Robinson's court vision and passing ability are still a bit subpar at this stage, as he's drawn more defensive attention than he's seen in past seasons, and he hasn't seemed to adjust to feeling defenders collapsing in the post or on the drive. Improving as jump shooter will also be a big key Robinson and his NBA potential. After shooting only 17 jumpers all of last season, he's shot nearly four times that many as a junior, but connected on an unimpressive 35% of those attempts. His shooting mechanics look improved, however, and he's shot 68% from the free throw line this season, up from a miserable 51% as a sophomore. Establishing himself as a reliable mid-range jump shooter will open up opportunities for him to attack more off the dribble and make him more of a pick-and-pop threat, adding another dimension to his game on the offensive end. While he certainly has work to do in this area, the progress he's made is a step in the right direction. Defensively, Robinson has excellent potential to defend the power forward position in the NBA. He's big and strong enough to defend on the block, and he's quick enough laterally to defend more perimeter-oriented four men and help on pick-and-rolls. He's extremely active and plays with great energy and toughness, and his three years playing for Bill Self at Kansas should serve him well as he makes the transition to learning the defensive schemes at the NBA level. While many saw a big season coming from Robinson, the extent of his individual and team success has been very impressive. Scouts may differ on just how much upside he has to tap into, based on the polish he can add offensively, but Robinson has certainly elevated his draft stock into the mid to high lottery with his decision to return for his junior season. His incredible motor and the enthusiasm he plays the game with are extremely appealing to NBA teams, and his combination of physical tools and production at the highest level of college basketball should earn him a very high draft pick this June. Stuck in the shadows of NBA lottery picks Marcus and Markieff Morris, Thomas Robinson played just 14.6 minutes per game last season, not being asked to do much more than run the floor, offensive rebound, post up occasionally, and finish whatever plays his teammates managed to create for him around the basket. With five of the six players who saw more playing time than him last season now out of the program, though, Robinson will finally have an opportunity to shine in a featured role. If his play this summer at events like the LeBron James Skills Academy or adidas Nations counselor games is any indication, Robinson is on the verge of having a breakout season that will put him firmly on the national radar screen as one of the best players in college basketball, as well as one of the top NBA prospects. Robinson has prototypical physical tools for an NBA power forward, listed at 6-9, with a chiseled frame, and a 7-foot plus wingspan. He's an unbelievable athlete on top of that, quick in the open floor, extremely strong, and highly explosive around the basket. Robinson didn't play enough minutes to qualify in most statistical categories last season, but if he did, would have ranked as the #1 defensive rebounder in the NCAA on a per-minute basis, and 2nd best overall per-minute rebounder behind NCAA record holder Kenneth Faried. The 60% he shot from the field also ranks him #1 amongst all prospects currently in our top-100 rankings, showing how efficient he was in the role he was asked to play. Offensively, Robinson isn't an incredibly naturally skilled or polished player, but he finds a way to contribute nevertheless thanks to his tremendous physical tools and the aggressiveness he brings on each and every possession. A capable threat to post-up opponents with his back to the basket, Robinson shows incredibly nimble footwork, long strides, and the ability to execute impressive spin-moves that put him right at the basket. He's the type of athlete who can easily elevate off two feet for a dunk from a stand-still without a moment to gather himself, making him a terrific target for passes from his guards. While not incredibly tall, the aggressiveness in which he posts up, banging up against opponents, carving out space and calling for the ball assertively, often gets him deep paint position which allows him to get off very high percentage shot opportunities. Facing the basket is where we're likely to see more of Robinson in isolation situations this season, as he shows tremendous potential as a mismatch threat here. He has a fantastic first step that most collegiate big men simply cannot stay in front of, which draws him plenty of fouls and free throw attempts. Robinson only took only ten jump shots last season according to Synergy Sports Technology, but showed solid mechanics from what we could see on film, indicating that he could have some untapped potential here down the road. The fact that he was only able to convert 51% of his free throw attempts last season means that he still has plenty of work to do in this area though. He could still stand to improve his decision making skills and passing ability as well, as he at times looked a bit out of control last season. Defensively is where NBA teams will likely see the most potential in him initially. His combination of length, strength, athleticism and intensity is simply ideal for a power forward, giving him the versatility to guard virtually any position on the floor. Already we regularly see Robinson switching out onto guards and having no problem at all staying in front of them on the perimeter. He does a great job moving his feet and using his terrific wingspan to contest shots, and brings a real business-like approach to his work on this end of the floor. His rebounding ability, as touched upon already, is obviously a huge plus on top of that, and is something that looks very likely to translate to the next level. He regularly goes well out of his area for loose balls, showing terrific tenacity in the process. Robinson's demeanor is likely something NBA executives and coaches will find extremely appealing, as he's an incredibly tough, aggressive, confident player who loves to mix it up inside the paint, and gives great effort every minute he's out on the floor. It's one thing to have the physical tools needed to make an impact on any given possession, but to be willing to use them at all times is something you don't find too easily. While at times it can be difficult to project the trajectory of underclassmen who are about to undergo major role changes at big-school teams such as Kansas, Robinson's case seems pretty clear cut. He almost certainly would have been a top-20 pick had he entered the draft last year, and everything about his profile suggests he's primed for a huge year that will elevate his stock comfortably into the lottery of a much more stacked class. If he can find a way to lead Kansas deep into the tournament, he could be picked much higher than that even. A video profile featuring Kansas junior Thomas Robinson from the adidas Nations Experience in Los Angeles. 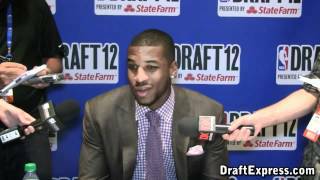 A marginal player averaging just 7.2 minutes per game in his freshman season, Thomas Robinson struggled to get playing time on a loaded Kansas squad that was ranked #1 overall in the country for much of the year. While Robinson is unlikely to be one of Kansas' top options this upcoming season, he is regardless a prospect to keep an eye on down the road, as he's a physically gifted player who was a consensus top-30 high school recruit. He's got good size at around 6-8, sports a chiseled NBA body, possesses a nice wingspan and is an outstanding all-around athlete. Robinson is a limited offensive player based on what he showed in the minutes he did receive last season. He gets most of his shots by crashing the offensive glass, running the floor in transition, and cutting to the basket, taking advantage of his strong frame and terrific leaping ability around the rim. His ball-handling skills are very limited and he shows nothing in the ways of a jump shot, turning the ball over on 26% of his used possessions and converting an abysmal 39.5% of his free throws last season. He does possess somewhat of a post-up game, showing some nice footwork around the basket and the ability to just outmuscle and out-quick opponents inside the paint. He gets to the free throw line at a great rate relative to his playing time for all these reasons above, which is something to keep track of down the road. Robinson is quite an asset for a college basketball team to have on the defensive end thanks to his terrific physical attributes and aggressive style of play. He brought great energy in limited minutes off the bench for Kansas last year, mostly at the center position behind Cole Aldrich. He's a superb per-minute rebounder who crashes the glass with reckless abandon, especially on the offensive end. He also blocks shots at a terrific rate and gets in the passing lanes quite well, but is extremely foul prone at the same time. Last season was mostly about gaining experience amongst Kansas' crowded frontcourt, and it's likely that this year we'll see much of the same from Robinson considering the type of talent the Jayhawks return. Depending on the progress of his skill-level on the offensive end, it might take some time before Robinson is able to establish himself as an immediate NBA candidate. Regardless, he's a player that NBA scouts will want to continue to keep track of over the next few seasons. Top power forward prospect and potential McDonalds All-American Thomas Robinson (#20 Scout, #18 Rivals, #54 ESPN) had a hard time backing up the hype this weekend, struggling through a bad first game and then barely playing in the second due to foul trouble. Regardless, he dropped enough glimpses of what makes him such a highly touted prospect to give us a good enough idea of what he brings to the table, even if we might not quite have gotten the full picture. Robinson is first and foremost a physical specimen, possessing outstanding length and athleticism on a terrific 6-8 frame. He is quick off his feet and highly explosive, and not afraid in the least bit to utilize his tools. Robinson gets most of his production off hustle primarily at this stage in his development, as he is one of the hardest working and more intense players youll find at the high school level. Known as one of the best rebounders in America right now, and he did not disappoint at this tournament, grabbing 8 offensive boards in the first game (12 total) and 9 in just 13 minutes in the second. Robinson plays with an incredible amount of energy, going after every ball in his area or outside of it, and doing a great job putting his athleticism and length to good use on the defensive end especially. He has a great knack for coming from the weakside to block shots, but also very much capable of putting pressure on the ball on the perimeter. This versatility to defend multiple positions will give Bill Self Robinson quite a few options next year, allowing him to utilize him in a Julian Wright freelance type role at times, or switch on screens guarding the pick and roll. Offensively, Robinson looked a bit limited at this tournament, not showing great ball-handling skills and clearly possessing very little in the ways of a perimeter jumper. He has some basic moves he can utilize in the post, and has the ability to finish with either hand around the rim, but he has a ways to go in terms of his overall polish from what we could see here. He is able to beat his man off the dribble at times with a very nice first step, but will need to work on his ability to create his own shot if hes to eventually convert to the small forward position down the road. Adding significant intrigue to Robinsons profile is the fact that he appears to have tremendous intangiblesshowing an outstanding attitude while on the floor, and always cheering on his teammates from the bench. He is a good passer as well, and as mentioned possesses a tremendous motor. His feel for the game and overall knowledge of how to operate on the floor are things he will need to work on while at Kansas, as he tends to get ahead of himself at times and tries to do a little too much. Kansas fans have a lot to look forward to, as were talking about a potential crowd favorite coming in, and it will be very interesting to see how Robinson develops over time.